Working in the libraryâ€™s Teen Department, I frequently hear from teens (and their parents) about the quest to obtain a driverâ€™s permit.Â It can be an exciting and anxiety-ridden time for everyone involved. Unfortunately, formal, school-based driver education programs are virtually non-existent these days.Â Fear not–helpful resources are at hand! Even if there isnâ€™t a formal driver education program near you, there are some options for parents and guardians to get teens off to a good start behind the wheel. 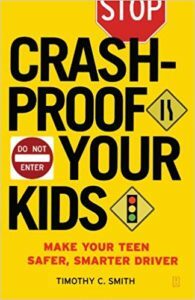 Crash-Proof Your Kids: Make Your Teen A Safer, Smarter Driver by Timothy C. Smith is a solid, no-frills tool for adults teaching teens to drive.Â Smith arranges the book using the same philosophy as the graduated driver license, each section introducing new skills building on previous mastery and experience.Â All of the basics are covered–car care, safety of all sorts, fundamental driving skills, awareness, emergencies, road conditions, residential and highway driving, etc.Â The text is clear, concrete, and friendly as is the approach. Smith also addresses parental driving habits and outlines a contract between new drivers and their adults. There are no illustrations, so use this book with other resources for complete instruction.Â Whether used in whole or in part, this is a useful option. 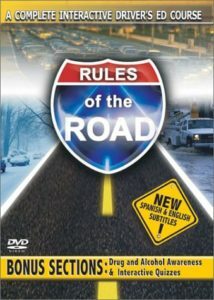 Rules of the Road offers, in DVD format, valuable information for teen drivers and their parents.Â The factual content is spot on–clear directions and explanations, helpful footage and illustrations, sound reasoning–directly and concisely communicated.Â However, the presentation is pure cheesiness–a super duper block of it, in fact. This DVD is an excellent resource though. How then to use it without the trappings overwhelming the message? One way is to focus on the DVDâ€™s â€œSpecial Featuresâ€ content instead of the main portion of the video.Â This supplemental section consolidates key information with clear camera work minus the banter. The chapters â€œBasic Maintenanceâ€, â€œIn Case of Emergencyâ€, â€œSigns Indexâ€, and â€œ3D Illustrationsâ€ are particularly useful. Â â€œ3D Illustrationsâ€ is excellent as it offers computer-animated instruction with some multi-angle viewing options. The â€œSpecial Featuresâ€ alone make Rules of the Road a valuable resource. Another option is to embrace the cheese.Â Watch the full DVD together with a lighthearted approach, tongue-in-cheek; itâ€™s a great opportunity to show a sense of humor and to start a conversation.Â The main content provides important instruction in basic vehicle operation, city and highway driving, safety under normal and hazardous road conditions, and expectations for the driverâ€™s license exam.Â There is also an thorough discussion of the dangers of impaired driving. Throughout, there are opportunities to jump to related topics in â€œSpecial Featuresâ€ and to take practice quizzes. A point to consider regarding both the book and the DVD…these tools, while valuable and sound, are a decade old and do not offer the in-depth coverage needed of cell phones as a cause of distracted driving.Â Be sure to supplement information on this important topic. Need to study for Missouriâ€™s written driver permit/license exam?Â We have a resource for that, too! Driving-Tests.org is a one-stop study spot.Â Among its many treasures is the latest version of the Missouri Driver Guide: A Guide to Understanding Missouri Motor Vehicle Laws and Licensing Requirements, the official handbook for driver license information.Â Available in PDF, it can be read online or downloaded to an electronic device.Â The siteâ€™s FAQs are well organized, concise, easy to read, and address the basic questions expected.Â But, the practice tests are what make this tool amazing. Questions are arranged in batches according to difficulty and cover material on the actual exam with a separate section for road sign identification.Â You can access this tool from the libraryâ€™s website or directly at https://joplinpl.driving-tests.org/missouri/. In addition to the previous resources, the libraryâ€™s Teen Department has partnered with safety organization First Impact to provide a free program for the Joplin area.Â First Impact is a statewide initiative of Think First Missouri, part of the University of Missouri School of Medicine, working with trainers from across the state to equip parents and guardians of teens taking the wheel.Â First Impactâ€™s presentation is designed to â€œteach parents about Missouriâ€™s Graduated Driver License (GDL) lawâ€ and to â€œprovide them with the tools they need to monitor, coach, and support their new teen driverâ€. Although the information is tailored for adults, teens are welcome to come along. First Impactâ€™s presentation will be held at the Joplin Public Library on Tuesday, November 27, from 6:00-7:30 pm.Â Speakers will be Sgt. John Lueckenhoff of the Missouri State Highway Patrol and Deana Tucker Dothage, Director of First Impact.Â There is no charge to attend, but registration is required.Â Register by calling First Impact at (573) 884-3463 or online at https://firstimpact.missouri.edu/events/first-impact-traffic-safety-parent-program-at-joplin-public-library/ Â For more information, email firstimpact@health.missouri.edu Â The event is free, no library card needed.Â Register soon to save a seat!